The Super 8 in Hancock, MD is centrally located at the intersection of I-68, I-70 and SR 522. There are so many things to do, you'll need more then one night. Enjoy Whitetail Resort for skiing, snow boarding and fly fishing you will enjoy hiking or biking on C&O Canal/Rails and Trails, stroll through the antique shop downtown while choosing which restaurant to dine in. No matter your interest, everyone is sure to enjoy the beautiful scenery especially during the fall season. 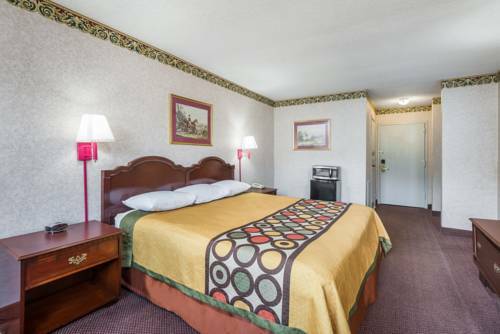 While staying with us, you can choose from a room with King or Double size bed, we also feature suites with whirlpool tubs. All rooms are equipped with hairdryers and AM/FM alarm clocks. You can enjoy Free Superstart breakfast daily and access Free wireless internet from anywhere in the property. Sit in your car as it defies Newton. Unexplained anomaly or optical illusion?